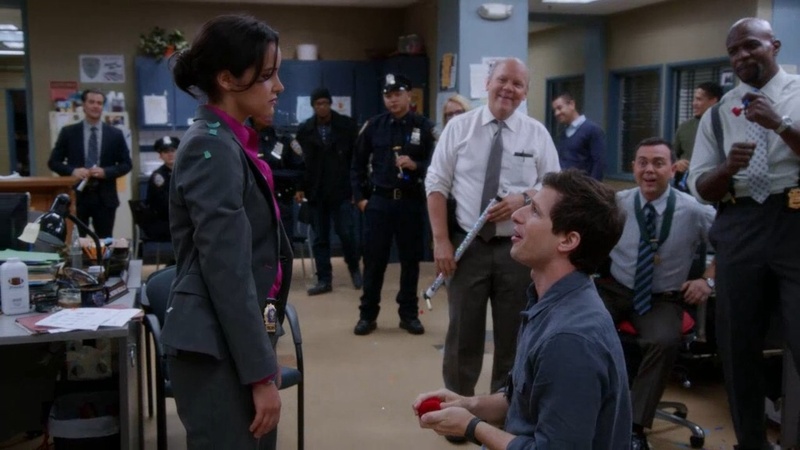 Amy x Jake. . HD Wallpaper and background images in the Brooklyn Nine-Nine club tagged: photo brooklyn nine-nine amy and jake the bet proposal. This Brooklyn Nine-Nine photo contains business suit. There might also be mahusay bihis tao, suit, pantalon suit, pantsuit, kalye, lungsod tanawin, urban na setting, dress suit, full dress, tailcoat, buntot amerikana, tails, puting itali, and puti itali at tails.